I had a feeling this wasn’t going to end well. You may have heard about the lawsuit filed by the Girl Scouts of the USA against the Boy Scouts of America for infringing on their trademark by dropping “boy” from Boy Scouts, calling it instead Scouts BSA. Among the damaging effects the GSUSA says it has suffered is the confusion that has arisen. Families, schools and communities are being told that the two organizations have merged, they say, or that the Girl Scouts have folded operations. Parents interested in Scouting for girls have mistakenly signed up for Cub Scouting instead of one of the GSUSA’s programs for younger girls, according to the lawsuit. While it studies the lawsuit, the BSA stated that it “applaud[s] every organization that builds character and leadership in children, including the Girl Scouts of the USA.” The statement goes on to say that they believe that there is room for both organizations to serve girls and boys in our communities. Don’t put the words “girl” and “Scouts” together. Doing so directly infringes on the GSUSA’s trademark. Girls who are members of the BSA are not “Girl Scouts” – they are female members of the BSA. Call them “Cub Scouts” or one of the ranks, or just “Scouts” in a Scouts BSA unit. This applies to promotional materials, printed documents, websites and at meetings. Don’t use GSUSA names, logos or symbols. Again, we are not them and their symbols must not be combined with ours. Don’t compare our programs to other youth organizations. Scouting is unique and there really is no comparison. We do many things that other youth groups also do; each has its own appeal depending on the child. No one program is right, or wrong, for everyone. Don’t misrepresent the BSA. If you get an inquiry about Girl Scouts, point them to the nearest GSUSA unit or council. (It’s a good way to learn who’s who in our sister organization.) If someone from the news media contacts you for a statement or opinion, decline to offer one. Instead, refer them to the BSA’s national public relations office. It’s important that we as volunteers don’t misrepresent the organization as a whole, and the PR folks at the National Council can provide the definitive answers. Do correct anyone who says we’ve merged or that we are the same organization. Do so politely (A Scout is Courteous) but make it clear that both still exist. Use official logos, service marks and terminology when referring to our programs. The BSA has a brand center that contains scores of logos, promotional artwork, email templates and more to ensure that you are communicating about Scouting the right way. Many of these guidelines are illustrated in a Branding Dos and Don’ts infographic that you should share with your unit leaders. 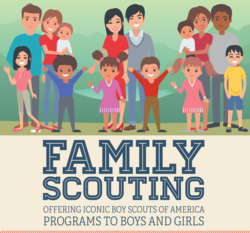 It’s part of the Family Scouting resource page with much more information on the program.